May 11, 2011 – San Jose, California Thanks to a new solar water heating incentive program from the state of California, The Tradewinds, a community of condominium homes nestled in the heart of San Jose’s Blossom Valley, will become the largest solar water heating project in the state. Construction on the project is expected to start this month. The community of 320 residential units, approximately 80% of which are owner occupied, uses an average of 10,000 gallons of hot water per day for showers, laundry, dishwashers, and other residential hot water necessities. Heating water with solar energy rather than with natural gas will reduce the building’s water heating bills by as much as 60%. 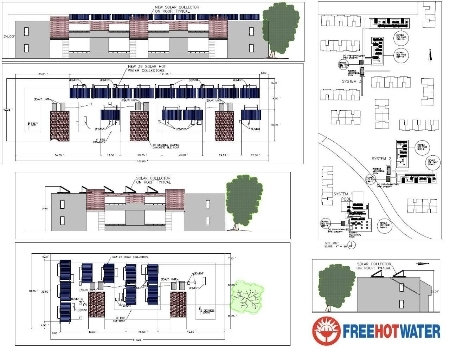 Free Hot Water, the solar system’s San Jose-based manufacturer, engineer, and designer, will use a total of 183 commercial grade FHW7000 series solar hot water collectors that will be mounted on five tar and gravel roofs of the two story buildings in the Tradewinds complex. Paul Burrowes, COO of Free Hot Water, added that the solar hot water system will help California to reach its recent goal of 33% renewable energy by 2020. “We calculate that The Tradewinds will produce over 5 million BTU’s daily and save over 250,000 pounds of CO2 on an annual basis,” Burrowes says. In addition to the long-term cost and environmental savings, The Tradewinds home will benefit from the new California Solar Initiative (CSI) Thermal Program. The initial calculations for The Tradewinds show a CSI-T rebate value of approximately $186,240. As a non-profit home owners association (HOA), the project does not benefit from tax incentives that would have reduced the overall costs further for a building owner. Unlike any other complex of its kind, the crown jewel of The Tradewinds is its private sports club facility, which boasts such amenities as an indoor swimming pool, spa, sauna, racquetball court, full-size basketball court, weight/cardio workout room, billiards, table tennis, a barbecue patio, a multi-purpose room and outdoor tennis courts. The complex also has its own satellite/cable television network, allowing all home owners to have access to their preferred cable or satellite provider, without having to install costly hardware or dishes. Comfort Energy is a full service team of licensed, highly trained and experienced professional designers, installers and service technicians able to address every need of your indoor environment and air quality comfort. Our company reputation has been built on excellence and our quality of work speaks for itself. With our engineering staff and resources, we are able to offer a wide variety of cutting edge design & build applications to meet your needs – whatever it may be. TBI Energy provides customers with investment grade energy audits, energy efficiency retro-fit project design and management, rebate management, ROI analysis and continuous commissioning. Our construction management division ensures that the best construction management practices are applied to sustainable project scheduling, cost accounting and regulatory compliance. We are committed to delivering energy efficiency projects that pay for themselves in addition to their many tangible and intangible environmental benefits. TBI Energys’s long time experience with sustainable projects for both public and private sector clients ensures that our customers take advantage of every worthwhile incentive, grant, rebates and tax credit available as they work to make their operations more efficient while reducing their impact on the environment.